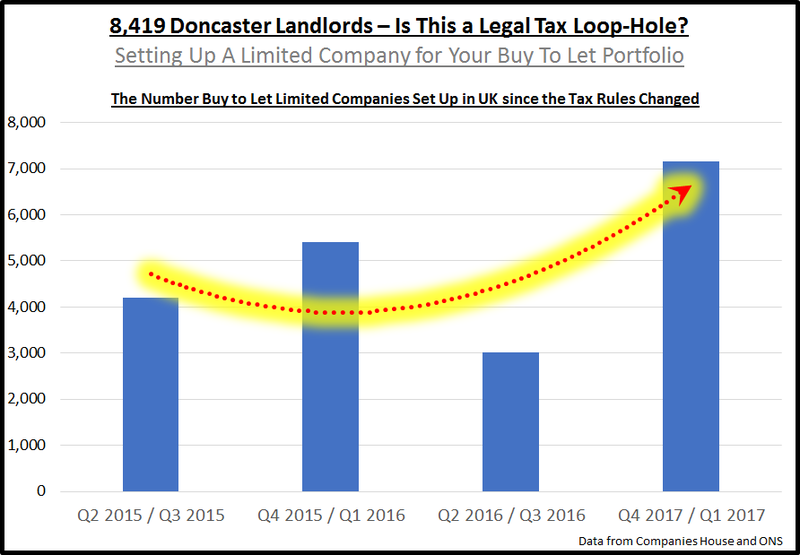 8,419 Doncaster Landlords – Is This a Legal Tax Loop-Hole? In November 2015, George Osborne disclosed plans to restrain the buy-to-let (BTL) market, implying its growing attractiveness was leaving aspiring first time buyers contesting with landlords for the restricted number of properties on the market. One of things he brought in was that tax relief on BTL mortgages would be capped, starting in April 2017. Before April 2017, a private landlord could claim tax relief from their interest on their BTL mortgage at the rate they paid income tax – (i.e. 20% basic /40% higher rate and 45% additional rate). Landlords who are higher rate tax payers are going to have be a lot smarter with their BTL investments and ensure they are maximising their rental properties full rental capability. 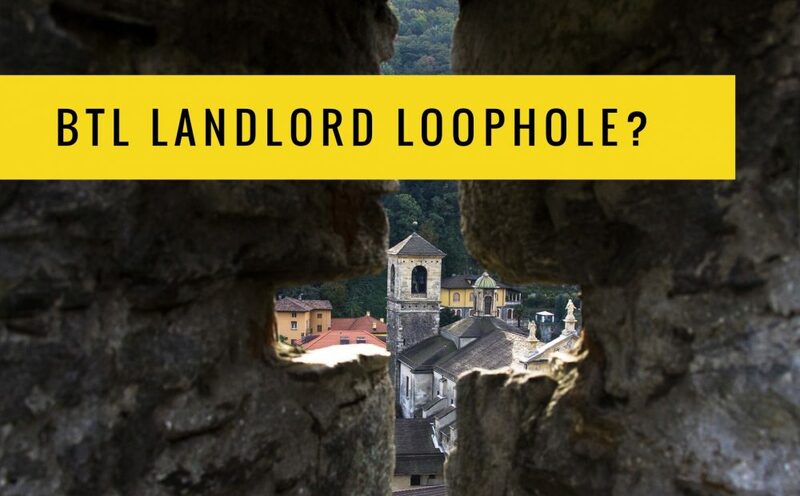 However, there is another option for landlords. In fact, looking at the Numbers from Companies House – many landlords are doing this. In the UK, there are 93,262 Buy To Let Limited Companies, and since the announcement in November 2015 – the numbers have seen a massive rise. So, by selling their buy to let investments to their own limited company, owned 100% by them, these landlords could then offset the costs of running their BTL’s as an ‘allowable expense’ – effectively writing off the cost of 100% of their mortgage outgoings, wear and tear and upkeep, letting agent’s fees etc. I am undeniably seeing more Doncaster landlords approach me for my thoughts on setting up a BTL limited company, so should you make the change to a limited company? In fact, I have done some extensive research with companies house in the 15 months (1st January 2016 to 31st March 2017 and 113 Buy To Let Limited Companies have been set up in the DN postcode alone). Well if you are looking to hold your BTL investments for a long time it could be very favourable to take the short-term pain of putting your BTL’s in a limited company for a long-term gain. You see, there are huge tax advantages to swapping property ownership into a limited company but there are some big costs that go with the privilege. As the law sees the new Limited Company as a separate entity to yourself, you are legally selling your BTL property to your Limited Company, just like you would be selling it on the open market. Your Limited company would have to pay Stamp Duty on the purchase and if you (as an individual) made a profit from the original purchase price, there could be a capital gains tax liability of 18% to 28%. The mortgage might need to be redeemed and renegotiated (with appropriate exit charges). On a more positive note, what I have seen though by incorporating (setting up the Limited Company) is landlords can roll up all their little buy to let mortgages into one big loan, often meaning they obtain a lower interest rate and the ability to advance new purchase capital. Finally, if the tax liability is too high to swap to a limited company, some savvy buy to let investors are leaving their existing portfolios in their personal name whilst purchasing any new investment through a limited company? Just an idea (not advice!). It’s vital that landlords get the very best guidance and information from tax consultants with the right qualifications, experience and insurance. Whatever you do, always get the opinions from these tax consultants in writing and you shouldn’t hurry into making any hasty decisions. The modifications to BTL tax relief are being progressively eased in over the next three years so there is no need to be unnerved and rush into any decisions before finding out the specifics as they relate precisely to your personal situation, because with decent tax planning (from a tax consultant) and good rental / BTL portfolio management (which I can help you with) … whatever you do – let’s keep you the right side of the line!